Keep it simple! Plant strong soups and lunch ideas. | Fat girl gone RAW! Keep it simple! Plant strong soups and lunch ideas. This gave me a very clear picture of what my body needed to stay “happy.” Seeds and nuts are really hard to digest, and after having only liquids/soups and smoothies for 10 days, I realized that I needed to slow my roll and ease back into whole foods. That realization in itself was a little bit of a bummer and I spent a day or two feeling rather depressed and frustrated with my self-imposed food limitations. However, I bit the bullet and made an appointment with a nutritionist, Linda Wagner, and came away with some really useful information and recipes. I decided I’d better use those recipes now! I hadn’t given myself any restrictive labels like “vegan” or “raw foodist,” but I was hoping to stick to a high raw diet that included lots of smoothies and juices. I also didn’t want to eat much dairy or grain. 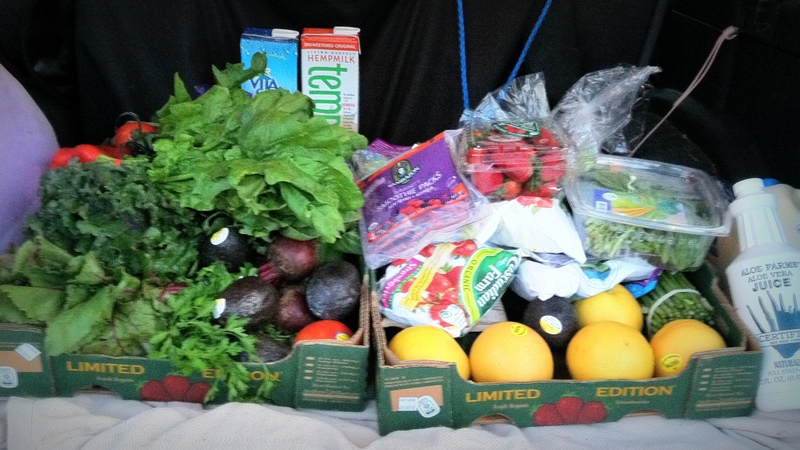 The first few days after my cleanse, however, I realized that it was really tough to make raw meals on the go. I was used to having liquid meals, and hadn’t accounted for the extra time it would take to figure out what I’d be eating for lunch and dinner. This has been an ongoing struggle! I started to build my army of helpful tools. First, I bought a mandolin. I figure if I’m going to make meals quickly, this tool will be a must. I also added a food processor (I bought the Hamilton Beach Chef Prep from Amazon) and a spiral slicer, which was recommended by the nutritionist. I am still adding as the budget allows, and slowly integrating as many organic ingredients (seasonings, etc.) as I can. Most importantly, I gave myself permission to cook my food. This adds a level of expertise that I already have and took away a lot of the pressure to find new and creative ways to prepare raw food. I have several raw food cookbooks, but there are times when I just don’t have the desire to pull them out and find something to make using what I have on hand. Instead, it’s pretty easy for me to saute some greens and throw a sweet potato in the oven! This has been a staple for lunch, along with my green juices and smoothies. Now, the fun part – I’ve been photographing my meals pretty regularly. I thought I’d try to blog every day or every-other-day, but I’m doing good to get to the computer once a week. I’ve had some requests for recipes, and this one was so good, I wanted it to be my first “official” recipe on my new blog. 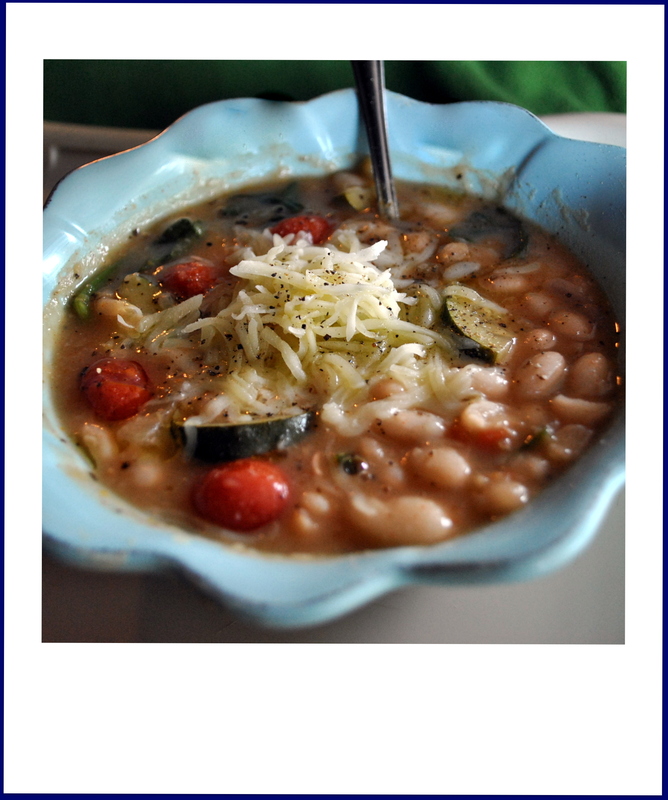 I knew I wanted to make an Italian-style soup, and after googling recipes for white beans, I modified this recipe to the one below. I would have never thought to blend some of the beans to make it more soup-y. Keep in mind that you can always add or subtract things to your liking – that’s what I did! 🙂 I was so impressed with this soup/stew – I hope you’ll try it! Instructions: Rinse and drain beans, then cover with water and soak overnight. The longer you soak, the better. Drain beans and rinse prior to use. To cook: Add water (or veggie broth) and rinsed beans in a large pot. Bring to a boil and with a large spoon, skim off white foam from the beans. Discard foam. Add bullion, bay leaf, garlic, diced carrots, onion, celery and Italian seasoning. Bring to a boil, then reduce to simmer. Simmer for 90 minutes. At this point, the beans should be tender. If not, you may need to add a cup or two of water and cook for another 1/2 hour. Sample a few beans and when they are tender, carefully remove about 3 cups of the beans and water. Using a blender, blend until creamy – add a little water if needed – then return to pot. Stir well to mix. Add remaining ingredients: zucchini, salt, pepper, red pepper, juice of lemon, cumin, paprika and tomatoes (if using frozen spinach, add now). Bring to a boil, then simmer for 10 minutes. 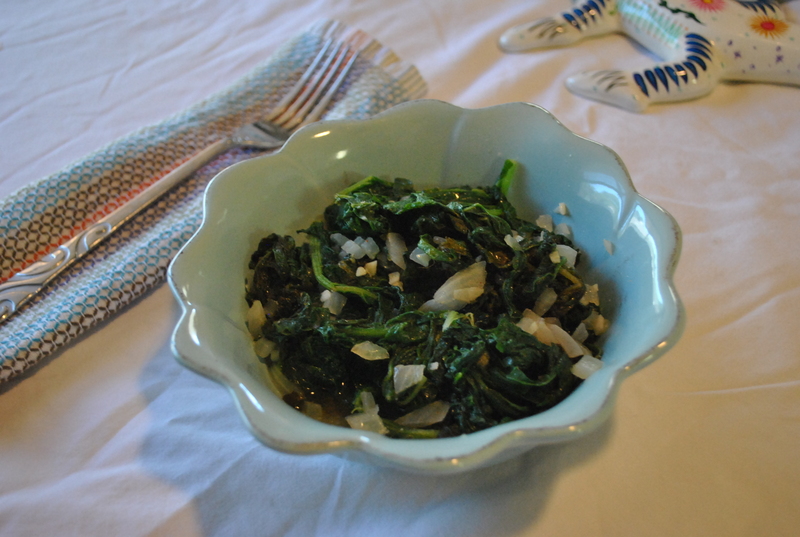 Add fresh spinach and stir well. Simmer for one minute, then turn off heat and serve. Top with shredded goat cheese mozzarella, salt, pepper and a drizzle of olive oil. Tastes great with a mixed green salad and balsamic vinaigrette. Considering the summer days are upon us, you may find this type of food a little heavy, but I served this to myself over a bed of raw kale. The kale softened considerably, and it also cooled down the soup. I loved it, and got double the greens in one serving. It was still a very dense and satisfying meal, and so much easier to digest with the added step of soaking the beans overnight. Soaking beans releases their nutrients, and makes them much easier to digest and more nutritious! Read more here. So, that’s all I have for now! Thank you for taking time to read my blog! !